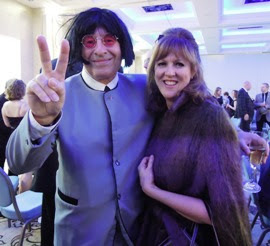 A charity murder mystery evening co-hosted by Peter James and held at the Grand Hotel, Brighton has raised in excess of £15,000 for local crime fighting charity Sussex Crimestoppers, more than doubling last year’s total of £7,000. The evening was themed around the Mods and Rockers invasion of the seaside town during the 1960s, and the charity used James’ expertise to give it a special twist; all 23 tables were named after James’ novels. The money raised included £4,000 from auctioning the names of characters to appear in his next novel. Kathy Burke, Chair of Sussex Crimestoppers, thanked local organisations who supported it and said: “The evening truly ‘rocked’ and we are absolutely delighted to have doubled the amount raised this year, we are so grateful to all the support we received from the residents, businesses and organisations of Sussex who helped make the evening so special.